I love traveling to the Alsace region of France, especially in the fall when the leaves are turning gold and the grapes are being harvested in the vineyards. As much as I love Paris and I try to stop for a few days when visiting the country, I think the Alsace region of France is one of my favorites for a vacation. After a day spent visiting winemakers and tasting their excellent wines, you can spend the evening in a cozy winstub with a glass of Riesling or Gewürztraminer and a slice of flammekueche. It is a cream fraiche, bacon and onion tart that is one of the region’s most famous dishes. Called tarte flambée in other regions of France and flammkuchen in Germany, this much loved thin crust, pizza like dish is usually baked in a wood oven and eaten as a snack or first course. It is so good that you might order a second one and call it a meal. Many of you have noticed my new header and have asked where the photograph was taken. I took the photo you see at the top of my posts in the Alsace region of France. Because of the interest in the photo, I thought I would share some information about Alsace and its famous wine road that I love visiting. The Alsace Wine Road is a wonderful route that runs south from Strasbourg with the Rhine river that borders Germany to the east and the Vosges mountains to the west down towards Colmar and beyond. It is probably one of the most picturesque places that you could ever visit. Picture 16th century villages, some with medieval walls still surrounding them, with narrow cobbled streets lined with colorful half-timbered homes laden with flowers. Vineyards run from the edge of the villages and continue up the hillsides. Perched high above the villages, you see remnants of medieval castles, one that has been restored is the spectacular Chateau du Haut-Koenigsbourg on the top of a mountain that can be seen from miles away. Spend some time in Strasbourg, head down the wine road and visit some of my favorite villages…Obernai, Ottrot, Ribeauville, Riquewihr and Kayserberg to name a few before reaching with wonderful town of Colmar. Colmar looks like it is straight out of a fairytale with its historic half-timbered homes lining the canals of its Petite Venise. There are wonderful hotels and bed and breakfasts all over the Alsace. While staying in the town of Ottrot, we walked to a small restaurant called L’Etoile D’Or for the very best flammekueche I have ever had. When I want to bring back the memories of our visits to the Alsace, I make my own flammekueche and thought I would share the recipe with you. Recipe serves 2, adjust according. Cook the bacon until it just starts to brown. Remove from pan and drain on paper towel, reserving a tablespoon of the bacon drippings in the pan. Add the onion slices and cook until soft and translucent. Remove and set aside. Mix the ricotta, crème fraîche, salt and pepper together until smooth. Flatten and stretch the dough into a rectangle and place on a sheet of parchment paper then roll the dough as thin as possible into a rectangle approximately 12 x 16 inches. Place the dough still on the paper onto a baking sheet. Spread the cheese mixture almost to the edge and then top with the onions and bacon. Bake until the dough is crisp, about 15 to 20 minutes. Cut into large squares and serve. Once you have tasted this Alsatian tart, you will be dreaming of visiting the Alsace region of France. Hopefully you will get a chance to explore its wonderful wine road where you can tour the quaint villages, taste excellent wines and have a slice of this traditional dish straight from a wood fired oven at a local winstub. I hope every time you visit Back Road Journal and see the header photo, you will think of this picturesque region of France and its famous flammekueche. This entry was posted in Uncategorized and tagged Alsace, flammekueche, food, France, Recipes, tarte flambee, travel, wine road. Bookmark the permalink. That’s a perfect looking flammekuche! Hi Rosemary, Thank you for your lovely compliment. Beautiful Captures and that tart looks delicious, but I am a sucker for pastry:) Happy Monday! Thank you Renee, for your nice compliment. I have so many wonderful photos from this area…it is so picturesque. Flammekuche is as delicious as it looks. Thanks for the delightful Alsace wine road tour, what beautiful scenery. Would love to stroll in those villages and town. Your Flammekueche is making me very hungry. Hi Norma, I’m glad you liked the little tour, the scenery in this area is outstanding. I know what you mean…I kept looking at that photo while I was writing this post and I’m hungry as well. Thank you for your lovely comment. I’ll make this for my guests in a couple weeks. This looks wonderful. If you haven’t read it, you might look for the book “Wine and War: The French, the Nazis, and the Battle for France’s Greatest Treasure” by Donald Kladstrup, which is about the wine industry in France and especially in this area during World War II. I thought perhaps your new header was from the region around Les Baux de Provence, as the patchwork quality of the fields and the backdrop of mountains looks very similar to the view from the top of the fortress there. Hi Naomi, Thank you for your nice comment. I have not read the book…I’ll see if I can find it as it sounds very interesting. I have been to Les Baux and it does have some similar scenery. I think your guests will enjoy flammekueche…my husband and I love it. Wow, my grandparents are from the Strasbourg area! It’s just lovely. We will be trying this tart very soon. Thanks for the recipe. Hi Mary, I agree with you about the area around Strasbourg being lovely. I’m glad you like the recipe and hope you will enjoy it. Thank you for your nice comment. Hi Afra, I’m glad you agree with me about flammkuchen. I think the ricotta and creme fresh worked well. I bet yours was good made with rye flour. Thank you for your nice comment. This seems like such a hearty and simple dish with lots of great flavours. Thank you Boleyn, for your nice compliment. This is a delicious dish that reminds me of our visits to Alsace. Wonderful! We were in Stuttgart, Germany for a couple of years and tried to travel as much as possible. Thank you for sharing your pictures and taking me back to some fabulous memories! Simple fresh foods, yum! Thank you Sandra, for your nice compliment. It is nice to know that you not only enjoyed the post but that it brought back nice memories for your time in Germany and your travels. Yes, I was also wondering where the beautiful header was shot. I’ve only even been through the region heading from Germany via Strasbourg to Paris, I think. It was so long ago. Would love to visit Alsace proper. This Flammekueche looks incredible. Bet it’s really tasty coming out of a stove with a glass of vino. Hi Johnny, So many people were curious about my new header photo that I thought I should let everyone know about it. I do hope you get a chance to visit Alsace as I think it is one of the loveliest regions of France. It was so good coming straight out of the oven that it went quickly and another one was ordered. With wine, it was a memorable evening. How lovely–the photos, narrative and flammekueche! Thank you Bonnie, for your lovely compliment. It is nice to know that you enjoyed the post. I love you photos and your tour of the Alsace. It has always been one of my favourite regions for white wines. Thank you Peggy, for your nice compliment. I’m glad you enjoyed the photos and tour. I have to agree with you about the wonderful white wines from Alsace. That first photo takes my breath away..(header perfection too! )It would look great in your kitchen framed.. Thank you Monique, for your lovely compliment. My husband says this photo reminds him of a painting. I find it difficult to get good pictures of distant scenery with a point and shot camera but I got lucky with this one. I do hope you get a chance to visit this lovely area but until that time do try making flammekueche. Thank you so much for your lovely compliment, Celi. I’m glad you enjoyed the post and the recipe. It has great flavor for something so easy to prepare…I think you will enjoy it Celi. Karen, that tart looks fantastic. I must give it a try. Lovely photos as usual. Thank you Terri, for your lovely compliment. I glad you enjoyed the photos. The tart is as delicious as it looks. Great shots of a beautiful region Karen and the tart looks delicious. During one of our Germany trips, we went to the Strasbourg area for the weekend and spent the nite at a B&B in a little village nearby enjoying the evening playing bocce ball with the families two sons. We loved the area as well. Thank you Larry, I always appreciate your nice compliments. I’m glad that you enjoyed the photos and that they reminded you of your visit to the area. I do think you would like the flammekueche…it is delicious. I love it to although it has been several years since I last visited. A little bit German. A little bit French. What is not to love? I can’t wait to give this recipe a try. It looks wonderful. Hi Karen, I think one of the reasons we like Alsace is just what you said, it is a little bit German mixed with French. It is a perfect combination as far as I’m concerned. I do think you will enjoy the flammekueche…it is very flavorful. Thank you for your nice compliment. I was in Colmar last spring and you do a wonderful job of capturing it. I loved flammekueche when I was there, too, and the restaurant we ate at was kind enough to make me a vegetarian version that was the envy of our table. Yum! Hi Erica, Thank you for stopping by for a visit and your nice compliment. I’m glad that you thought I captured the wonderful sights of Alsace well. Flammekueche is such a delicious dish and I’m sure your vegetarian version was terrific. Lovely photos and comments about Alsace. Thank you for the recipe…coming soon to a kitchen near me! Thank you Mary Ann, for your nice compliment. I’m glad that you enjoyed the post and photos of Alsace. I do hope you will enjoy the flammekueche. Gorgeous area of France. I could easily see visiting…or living…there. Hi Heather, The Alsace is one of the loveliest areas of France, I think. Yes, I could definitely live there as well. Beautiful countryside, great food, and very friendly people…what more could you ask for. Wow, and here I was trying to think of places in France that I’d like to visit other than Paris and South of France! Alsace looks amazing. Hi Christine, I do think you would love visiting Alsace…the countryside is beautiful with small villages and you have the wonderful cities of Strasbourg and Colmar that are very special to visit. I’m glad that you enjoyed the post. I had never heard of this dish but it looks yummy…I had only heard about this part of France and now I want to visit…gorgeous. Hi Donna, I’m glad that you enjoyed the post. The Alsace region of France is wonderful and if you ever have the chance to visit, I know you would enjoy it. Flammekueche is delicious…I hope you give it a try. Thank you for your nice comment. Oh for the LOVE……………….flammekueche…….I swooned! How maravelous! Alsace makes some of the MOST marvelous wine………….pea green with envy, I am! I’m so happy that you enjoyed the post and the flammekueche, Emil. I love the food, wine and the wonderful villages of this area…glad you agree. Thank you for your comment…always so enthusiastic. 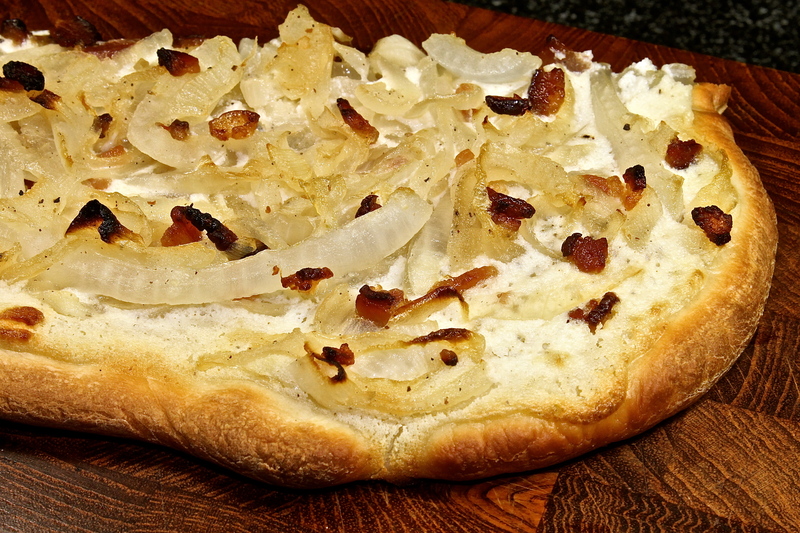 I can’t believe it – an elegant onion pizza!! I’m in heaven and the only thing that makes it better is the Riesling – which I love. Thanks for another 10 minute trip. I just love them. Hi Kelli, It is always nice to know that you like my little tours of favorite places that I have visited. Riesling and a slice of flammekueche are a match made in heaven. Yes, I do agree with you that it is like an elegant little white pizza. Thank you for your nice compliment. Incredible images and the tart looks delicious! Thank you Elizabeth, for your lovely compliment. I’m glad that you enjoyed the photos and the flammekueche. It really is as good as it looks. You nailed the flammekueche, and such pretty photos! So many familiar places. We spent a month in Eguisheim in the Fall of (I think) ’08. I had enough kitsch to last a lifetime, but it is an interesting area. And such lovely wines. Thank you Michelle, I’m glad you liked my recipe for flammekueche…I do enjoy it. Alsace is a lovely area and yes, it does have wonderful wines. I appreciate your nice compliment. I’m taking my first trip to Europe to this area in October. I’m feeling very adventurous in an anxious sort of way. My first concern, 9 hours on an airplane without being able to get off. Really don’t like that. Trapped. Hi Lea Ann, I know you will have a absolutely wonderful time. Do not dwell on something that you might not feel comfortable with, instead look forward to the new adventure that lies ahead of you. Believe me, you are going to have a terrific time…I can guarantee you that. Those topping ingredients sound like a great combination. I haven’t been to that region of France but it looks spectacularly pretty. What lovely little villages. Great header photo! Hi Suzanne, I’m glad you like the new header photo. I had to crop it a lot as you can see but I felt it let my readers see what you can discover on the back roads…no matter where you are. You are right about the toppings on flammekueche being a nice combination of flavors. Hi Charlie, I do hope you get to visit one day…it is so beautiful. Thank you for your comment. You took me most of the way to ‘childhood home’ of a few years again, Karen! Well, I may have been on the eastern side of the river and this the west 🙂 ! Am trying to remember whether I ever had the Flammeküche: a fun version of a bacon/onion tart . . . . I was so much into honeycomb tripe and mushroom ragouts and other stuff my parents’ friends cooked in Schwarzwald with so litle to cook with! Daresay I have forgotten and have to try again!!!! Hi Eha, I’m glad to have taken you almost home. Many times we have stayed on the eastern side of the river in the Schwarzwald and made day trips across to the Alsace. That is one of the nicest things about this area. You can visit two wonderful countries just by crossing the river. Do try the flammekuche and see if you remember having it before. I’ve never been to Alsace, and would love to go someday. And I know absolutely nothing about Riesling wine, and do want to learn, so a trip to the winemakers would be loads of fun, not to mention educational. Great flammekuche — I’ve tasted a version of this before, but have never made it. And it’s looks to be a pretty simple dish. Fun post, and I loved the pictures (including your new header). Thanks. Hi John, Thank you for your nice compliment. I’m glad that you enjoyed the post and photos. Do make you own flammekuche…it is so easy and so delicious. I hope you get a chance to visit the Alsace and tour the vineyards as the wines from that region are excellent. Thank you Uru, for your nice compliment. Rustic and delicious. We eat lots of Flammkuchen over here, esp. the onion one. Really delicious! Hi Angie, I’m glad to know that you enjoy flammkuchen…it is such a nice snack or meal. Thank you for your comment. I tried this in southern Germany and loved it. Thank you for the recipe. I will definitely try it. What a gorgeous area…I have to go there! Hi Debra, I know you would enjoy visiting Alsace…I hope you get a chance to visit. Don’t you just love flammekueche. I hope you enjoy the recipe. Thank you Barbara, for your kind words. I’m glad you like the new header photo and the post. Exploring the wine country sounds fun to me. What’s not to love about the region, Karen! I can easily see why you love it. The photo in the header almost doesn’t look real. 🙂 The Tarte Flambé is simply delicious. I would love to make this with a good bread dough! My goodness! Thank you Debra, for your nice compliment. I was lucky with my photo…I use a little point and shot when I travel. Your bread dough would be perfect for making a tarte flambée. Beautiful pictures, Karen! That is one of my favorite tarts! Hi Laura, I happy to hear that you like flammekueche. Thank you for your nice compliment…I’m glad you enjoyed the photos. Like your other followers I love your header picture & couldn’t quite place the exact region, Thanks for telling & showing me exactly were it was taken. This region is on my to do list, even more since I’ve just seen all your lovely photos. I too love to eat flammekueche especially with a glass of red wine.. Thanks for sharing your recipe, I’ve jotted it down as a snack lunch to share with friends this weekend..
Hi Barbara, I’m glad you enjoyed the background about my header photo…everyone was curious where it was taken. I know you will enjoy visiting the Alsace, there is so much to see and do. 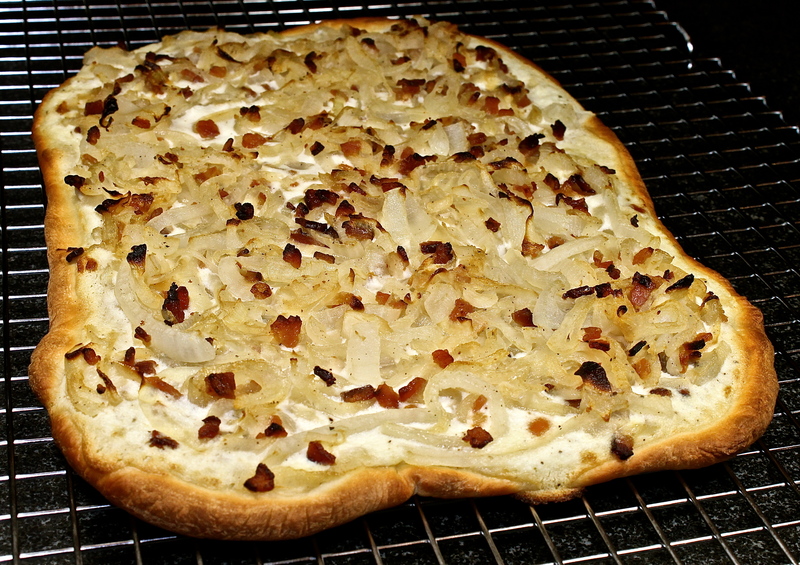 I hope you and your friends enjoy the flammekueche…it is so good when it is hot out of the oven. Thank you for your nice compliment. Wow! I have to go to Alsace region of France for a feast to my eyes, and eat flammekueche for a feast to my tummy! Beautiful and colorful photography. I appreciate the post! 😀 Fae. Thank you Fae, for your nice compliment…I’m glad you enjoyed the post. Alsace is a wonderful region to visit, it is so beautiful. Thank you Katy, for your lovely compliment. I’m glad you enjoyed the post. Hi Candy, Thank you for stopping by for a visit and your nice compliment. I’m glad you enjoyed the post. My husband and I always have a great time whenever we visit Alsace…beautiful scenery, great food and wine and lovely people. Hi Karen, my wife and I holidayed in Burgundy last year and we are loving their wines. I don’t want to become too narrow minded though. Can you recommend a good Riesling to get me into more Eastern France/German wines. Hi David, I have to agree with you…I love the wines from burgundy. As far as a riesling from the Alsace, Trimbach is probably best known for a wonderful dry riesling that I think you could find easily. Another exceptional one is Zind Humbrecht but it is very expensive, at least here in the states. I think the best bet is to see if you can find a wine merchant that will do a tasting of rieslings from both France and Germany, there are lots of good ones to enjoy. The castle is huge and the view from the top is wonderful. Thank you for your nice compliment. Alsaces, been a couple of times .. beautiful area and you can see on the wineries that they once belonged to Germany – very clean and tidy – compare to the French. Stunning wines too. Strabourg, Colmar and Mulhouse – in Illhaeusern, they have on of the 21 top restaurants in France – http://www.auberge-de-l-ill.com/V2/index.html – a place you would love. When I was there they didn’t have their two hotels. This dish will I try when I have girlfriends over … buy read dough. Love your photos … I was 35 last time I was there – 30 years ago. God, I’m truly old. 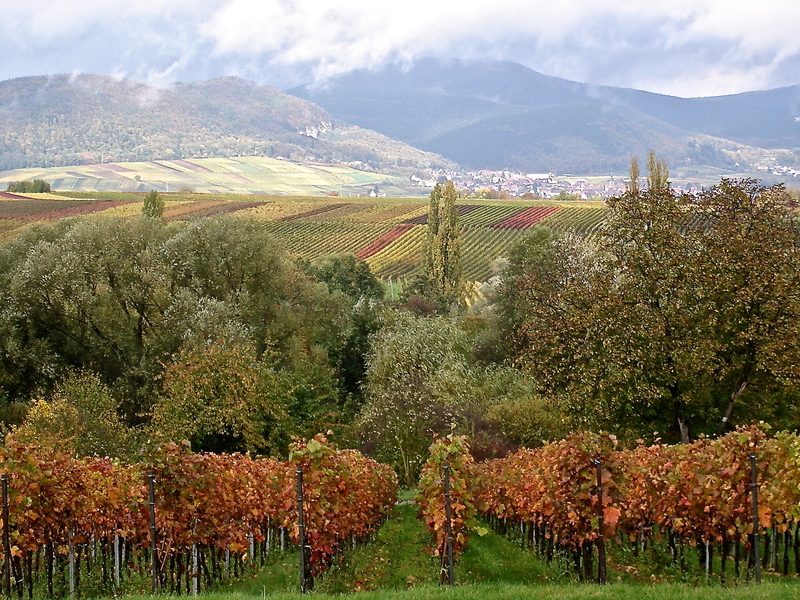 Hi Viveka, I have to agree that the vineyards in Alsace are beautiful…and surrounded by such pretty villages. We have been to several of the Michelin starred restaurants in the area but have not eaten at Auberge de I’ll. It seems that our timing has always been wrong and the restaurant was closed when we were in the area. I’m glad you enjoyed the photos and that they brought back nice memories. You are not old…and you make the most out of each day! Karen, I’m trying to recall the other top restaurant we where at – and stayed – I went so violent sick during the night. Thought it was the food – but I realized it was the grapes I had been eating from the stock the evening before, they had been sprayed with insecticidal. http://www.aux-armes-de-france.com – is the place in Ammerschwihr. Where you there maybe. It truly is a small world, Viveka. Yes…we have stayed at the Aux Armes de France and enjoyed the wonderful food. Not only that, we know the chef personally. We met chef Gaertner when he come to do a week of cooking in Florida when we lived there. We are friends with his daughter who now lives in Munich. How great this is – I don’t think he was there when I was there …. maybe he was … beautiful place and when you walk outside the wineries are just there. This is now 35 years ago – and it was then said that it was one of Caroline of Monaco’s favorite restaurants. Beautiful food and rooms was wonderful. We had our table in one of those small bay windows. We stayed there when we visit Illhaeusern once. Before they had their own hotel, the other times we stayed in Colmar. If he wasn’t there, perhaps it was his father. It has been in the family for years. We do have a lot in common it seems. I’d love to visit this part of France. Thanks for the wonderful pictures. Flammekueche tastes so good and yours looks marvelous! Hi Rosa, You will definitely have to visit Alsace…not that far of a trip for you. I’m glad you like the looks of my flammekeche. Thank you for your lovely compliment. Karen, absolutely stunning photography and a truly wonderful recipe – I love making and eating Flammkuchen even more than Focaccia and my family does too and therefore I make it quite often and you are so right to stress how delicious a treat this is when it comes out of the oven and gets eaten all warm and smelling just great! What a delightful post! Thank you for your kind words, Andrea. I was sure that you must make flammkuchen for your family. You are right about the flavor and smell when it is hot out of the oven. I’m glad you enjoyed the post and photos. Have a wonderful week as well. Tarte Flambe is one of my favorites! Lovely ode, Karen, to this wonderful dish as well as the Alsace region. Thank you Teresa, for your lovely compliment. I’m glad to know you like tarte flambée too. Thank you Jessica, for your lovely compliment. I’m glad you enjoyed the photos and the recipe. I so enjoyed the informative little narrative as well as the sound of your recipe. Lovely photographs too Karen. Hi Kate, I’m glad you enjoyed the post with the background about my header photo and the recipe. Thank you for your lovely compliment. Spectacular photos, Karen. I just added another area of Europe to my list of must see places. I will try this lovely tart so I can try a little taste of this wonderful region. Thank you Cathy, for your lovely compliment. I’m glad you enjoyed the photos. Yes, do add the Alsace to your list…we certainly enjoy it. I think you will enjoy the onion tart of Alsace. Love the new header picture and the other pictures too. The picture of the dish makes me think it is a wonderful French comfort food! Hi Southern, I’m glad that you enjoyed the photos and the story behind the new header. Yes…flammekueche is French Alsatian comfort food. Thank you for your nice compliment. Thank you for your compliment, Mad Dog. I know that you would really enjoy this Alsatian dish. Hi Tanya, I’m happy that I could supply you with a recipe for flammekueche. It is nice to know that so many others love it as much as I do. Thank you for your compliment…I’m glad you enjoyed the photos. Karen, THANK YOU for sharing those photos, they are simply magical. I’ve been to a few cities in Switzerland and Austria that are similar and the awe just never escapes me. This is the fourth blog now that is posting a flat-bread (the others were Focaccia) recipe, but I just love the toppings on this one. I made my first focaccia in the early nineties, I was sick at home with Mono and I copied the recipe in long hand from Biba’s Italian Kitchen (before the internet!). Her recipe has a sponge which makes the focaccia chewy and full textured. Your post has really made me want to button down and make this wonderful bread. Thank you Eva, for your lovely compliment. I’m glad you enjoyed the photos and the recipe for the flammekueche. I made a caramelized onion focaccia last night, thanks to your inspiration. The simple things in life are the best! I totally agree with you, Carolyn. Thank you for your comment. I am in love. I am planning on Paris the Spring of 2014 and Normandy – but may need to make yet another trip. The vineyards, the town, the food – that tart! Oh that tart! That tart and I (new to me) are going to become very great friends. Thank you Claudia, for your lovely compliment. Your trip sounds wonderful. Paris in the spring plus Normandy…that will be great. If you have a chance to visit Alsace on another visit, I know you will enjoy it as well. I’m happy that you like the flammekueche…it is a delicious treat. Hi Raymund, I know you will enjoy flammekueche. I hope you come across it on your trip to Europe. Thank you for your comment. Sounds like just the perfect thing to have with a nice Alsatian white wine. Beautiful. Hi France, You are right about this delicious treat being perfect with Alsatian white wine. I’m glad you like it…thank you for your compliment. Oh, my husband would marry me all over again if I made this for him 🙂 So simply delicious! Wow Susan, I think that you better get the ingredients together. 🙂 Thank you for your nice compliment and the chuckle. How delicious! And great scenery photos, too! Thank you Chunklet, for your nice compliment. I’m glad you enjoyed the photos and the recipe. Beautiful photos and wonderful dish! Hi Tessa, Thank you for your nice compliment. I’m glad you enjoyed the post. Hi Tandy, I’m glad that you enjoyed the post. You and your husband are like the two of us, we are always thinking about future trips. 🙂 Thank you for your nice comment. That dish looks delicious, Karen, and a recipe is the best kind of souvenir. Thank you John, for your nice compliment. I agree…anything food related is always a good souvenir. I hope today’s storm is mostly talk and no gale. Good luck, Karen. Thank you so much John, for your kind thoughts. Unfortunately I think New England is in for a real blizzard. What gorgeous pictures!! Looks like a beautiful and fun area to visit. The flammekueche looks delicious! I’d love of slice of it right now! Hi MJ, I’m glad you enjoyed the photos. The Alsace region of France is lovely and their traditional dish is delicious. Wish you could reach through your computer and take a slice. Thank you for your compliment. Flammekueche? I never had a chance to try this…and it sure looks delicious Karen. Thanks for sharing all the gorgeous pictures…have a wonderful week! Hi Juliana, Flammekueche hot out of the oven is delicious…hope you get a chance to try it sometime. I’m glad you enjoyed the photos from Alsace. Have a great week as well. Beautiful photos, Karen, and the flammekueche looks better than anything I have ever seen! I love it but I have never seen such a fantastic one in any restaurant. Is there a better way to bring back our travel memories than making a dish we tasted and enjoyed? Thank you so much Sissi, for your kind words. I do love flammekueche and thought this one turned out very well. You are so right about preparing food from our travels…it is a wonderful way of reliving memories of great food and great times. Absolutely beautiful photos and the recipe looks very delicious! Thank you Laila, for your lovely compliment. I’m glad that you enjoyed the photos and recipe. Flammekueche is delicious…I hope you get a chance to try it. Thank you Kristy, for your lovely compliment. I’m glad that you enjoyed the photos of Alsace. I think you are going to enjoy the flammekuehe…we certainly do. It looks like an amazingly beautiful area of the globe. And how fun that you can re-create your lovely time there with this delicious looking Flammekueche! Hi Chris, The Alsace area of France really is lovely…it’s one of our favorite areas to visit. Yes, each bite of flammekueche takes me back to France. Well of course I love your header…it looks like a painting…so beautiful! And thank you for some info about the Alsace region. We have a restaurant down the street called Cafe Alsace, and though I haven’t visited that part of France, I do love the food I’ve been exposed to, and spaetzle in particular. This Flammekueche is similar to an onion tart they make at the Cafe, but not quite the same. I love your recipe and it’s bookmarked to try! Hi Betsy, I’m glad you like the new header. The photo does look like a painting…it was a lucky shot. I hope you will enjoy the recipe. Thank you for your nice compliment. Thank you Anne, for your nice compliment. I’m glad you enjoyed the photos and recipe. I hope you do get a chance to visit Alsace…it is a lovely area of France. The food and wine from there is great. My dad’s family came from this area of Europe…and it looks like I need to visit! Gorgeous scenery…and I could live off this magnificent tart! Hi Liz, I think you would enjoy visiting the area where you dad’s family came from…it is a beautiful part of France. The onion tart is a good one. Karen, your pictures are beautiful. Thank you for the tour. Wine Road is breathtaking! Flammekueche looks delicious! Bacon and ricotta are an outstanding combination.., yummy! Thank you Judy, for your lovely compliment. I’m glad you enjoyed the little tour of the wine road…it is a beautiful region of France. You are right about the flavors of the flammekuech being a nice combination. PS – That is a beautiful photo in the header! I’m glad you like the new header photo, Wendy. Thank you for the compliment. Hi Wendy, I know what you mean about getting the crust thin for the flammekuchen. I stretched it and then rolled it on the parchment…let it rest and rolled it again. Your pictures are gorgeous! Thank you for sharing the journey with us. And this Tarte Flambée sounds awesome! Can’t wait to try it. Hi Amy, Thank you for stopping by for a visit and your nice compliment. I’m glad you liked the photo and recipe. I hope you will enjoy the flammekueche. Wow Karen!!! When my husband and I planned our trip to France this past fall we debated long and hard (not as in an arguing sort of way mind you!) about whether we’d do the Alsace this time or “next” time (optimistic there must be a next!) We couldn’t do it all (when can anyone ever?) so we missed this region…but we’ll be absolutely certain to visit it next time!! Your gorgeous photos really show well the beauty of this part of France! And the flammekueche looks fabulous! So nicely done Karen! Thank you Spree, for your kind words. I’m glad you enjoyed the photos and the flammekueche. I know that you will enjoy visiting Alsace…it is so lovely with great food and drink. I’m always thinking and wishing about where my next travels will take me. And Naples likes to think they’ve cornered the market on pizza. I so love the thought of ricotta on a “pizza”, top it with some roasted veggies like eggplant and red bell peppers? Maybe not so traditional, but probably yummy! Hi Ruth, This is similar to pizza but very light because of the creme fraiche mixed with the ricotta. I actually had a pizza with ricotta, cherry tomatoes, caramelized onions, and prosciutto with the remainder of my dough…very good as well. I should have taken a photo of it. Thank you for your comment. Thank you Sartenada, for your nice compliment. I’m glad that you enjoyed the photos. The first thing I saw was your new header photo and like others wondered where it was. Beautiful. And to sip on a classic Riesling or Gewürztraminer aaahhhhhh, you got me there Karen! Hi Claire, I’m glad you enjoyed the post about the new header photo. Readers were curious where I took it, so I thought I would let everyone know about the area. Thank you for your nice compliment. Beautiful photos Karen. They make me want to run down to the Alsace region in France right now! I had Flammkuchen for the first time this year and was surprised at how tasty it was. Glad to see that you were able to recreate it in your own kitchen. Thank you Laura, for your nice compliment. I’m glad that you enjoyed the photos. I’m glad that you have had the chance to taste flammkuchen and enjoyed it. It really is easy to prepare at home although nothing is quite as good as when it is cooked in a wood fired oven. I’ve never heard of flammekueche before. Clearly I need to get out more. I have, however, heard of the wonderful white wines from that region . . . so perfect with spicy Thai foods. Hi Jerry, I think if you haven’t traveled to the Alsace region of France or across the border into the neighboring region of Germany that you probably wouldn’t have heard of Flammekueche. You are right about the white wines from the region going well the spicy Thai food. Thank you for your comment. Beautiful photos! For some reason I would have never thought to make a Flammekueche myself… I will now! Thank you Petite, for your nice compliment…I’m glad you enjoyed the photos. Flammekueche is so easy to prepare at home. I hope you enjoy it. Hi Yinyin, Thank you for stopping by for a visit and your nice comment. I’m glad that you enjoy my blog and photos…I appreciate your compliment. LOVE the photos and LOVE that Tart – might be a nice light, yet filling choice for an easter brunch – with salad and some sweets! Thank you Carol, for your nice compliment. I’m glad that you enjoyed the photos and tart. I think you will enjoy the Flammekueche.